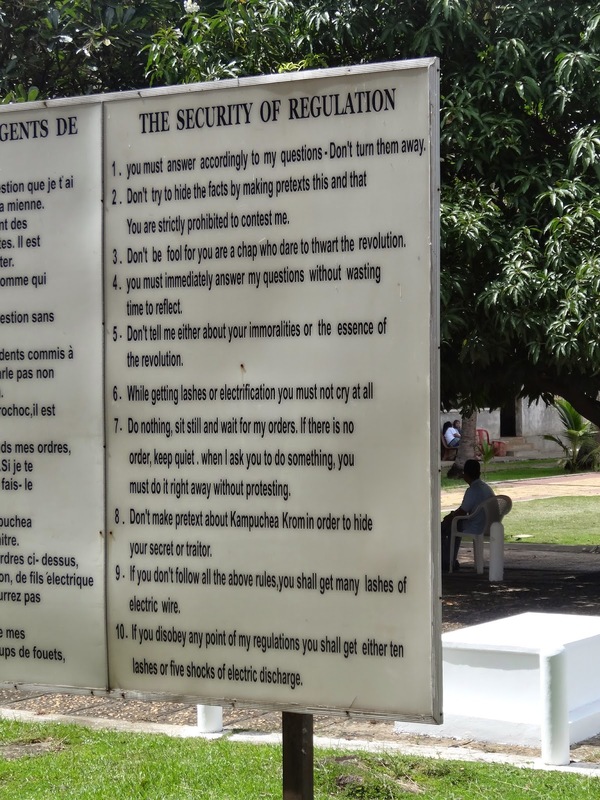 Our final visit of the trip was to the Tuol Sleng Genocide Museum. Originally a high schools Pol Pots turned the buildings into a prison and torture facility during his reign from 1975 to 1979. This place is eerie and has largely been untouched since his departure. People were held here in tiny cells, shackled and dirty. They were fed very little. Many died here and were taken to the Killing fields or simply tortured before being taken there to die. 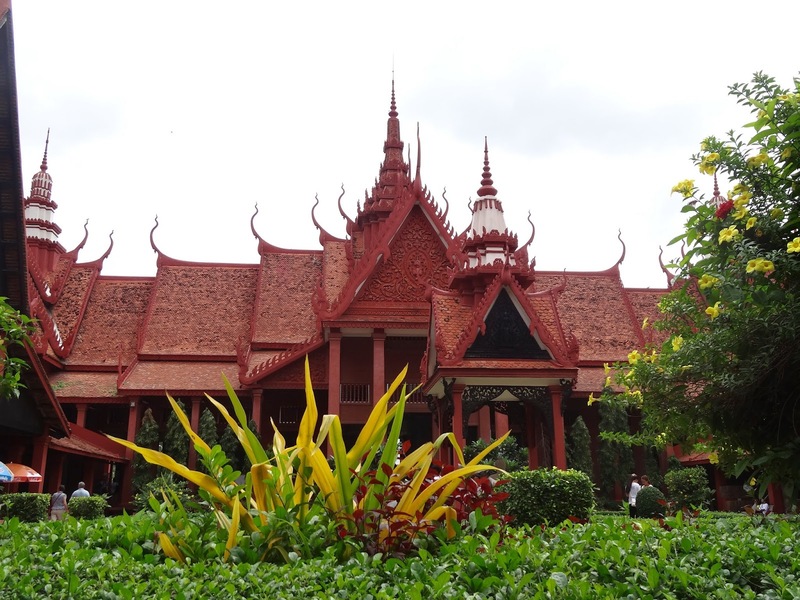 At the killing fields they were thrown into mass graves. Photographs of all those who were held and subsequently killed now line the walls of this desolate place along with drawings made by a number of survivors depicting life in the facility. The last 14 bodies found were buried here and countless skulls and bones were found, now they are piled inside cases. 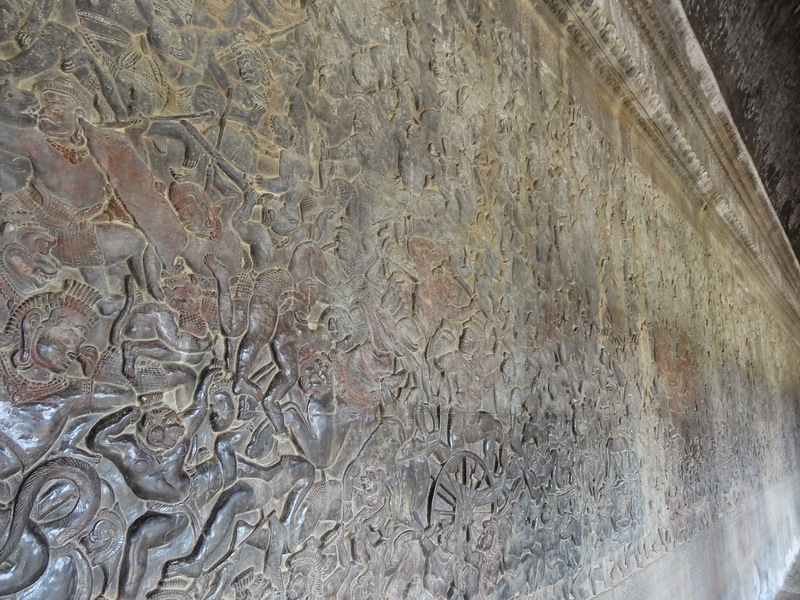 Photographs of the excavated killing fields also line the walls. It seemed a sad way to end our two week holiday. However, these things certainly shouldn’t be ignored especially when things of this nature are still, sadly, happening today. 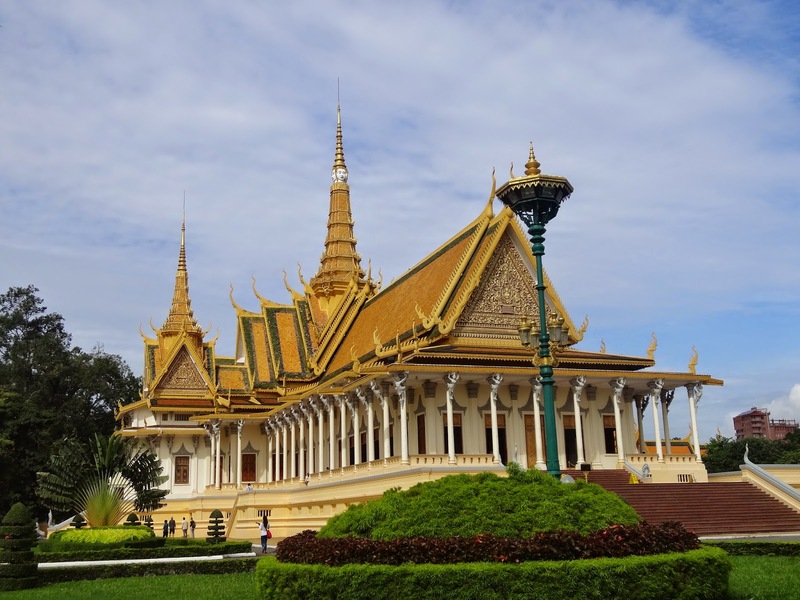 We started the day with a visit to the Royal Palace built in 1866 by King Norodom, now the home of the Cambodian King. The buildings here were very beautiful and colourful. 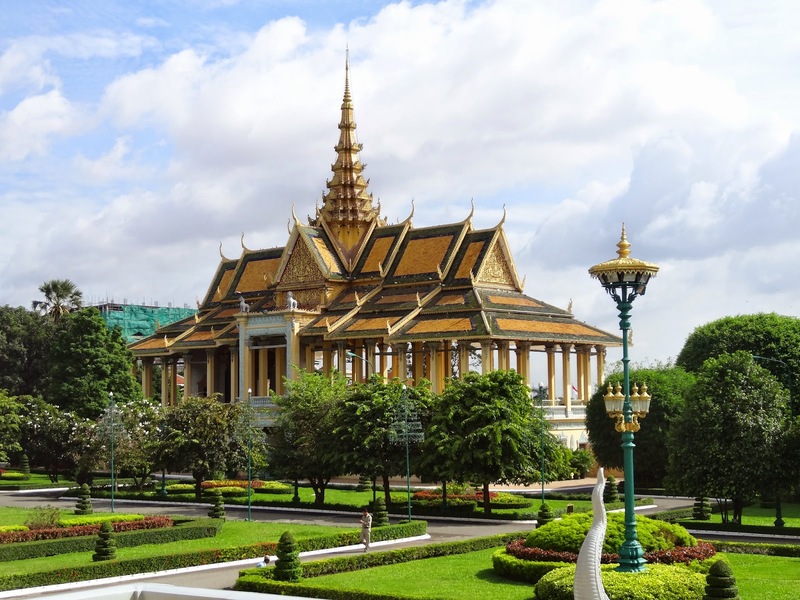 The highlight of the palace visit was the silver pagoda. The name comes from the floor which is made up of 5000 solid silver tiles, a total of 6 tonnes of silver. Sadly, despite being made to remove our shoes the majority of the tiles are covered with large rugs, presumably for protection. 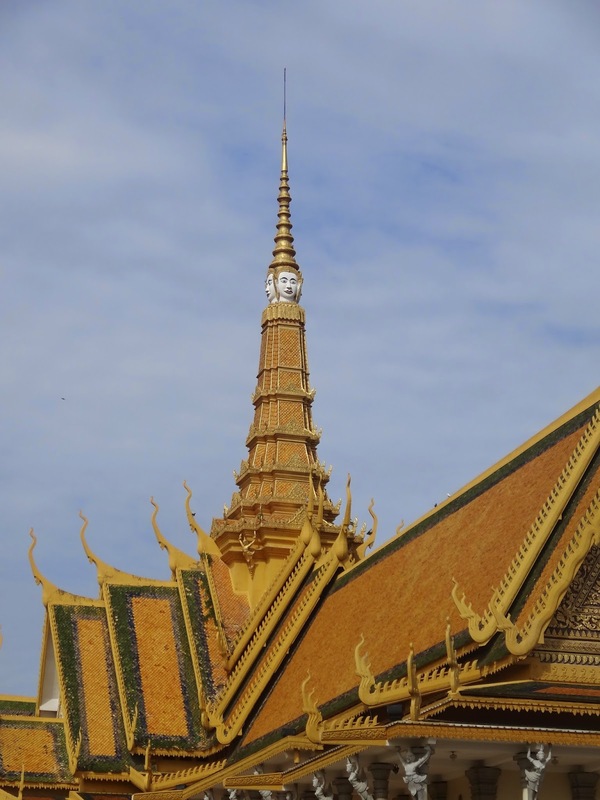 The other stunning feature of this pagoda are the beautiful treasures inside, gifts to the royal family over the years. A solid gold Buddha weighing 90kg and encrusted with 9,584 diamonds is the main attraction but there are many beautiful and expensive pieces in this pagoda, no pictures were allowed here. 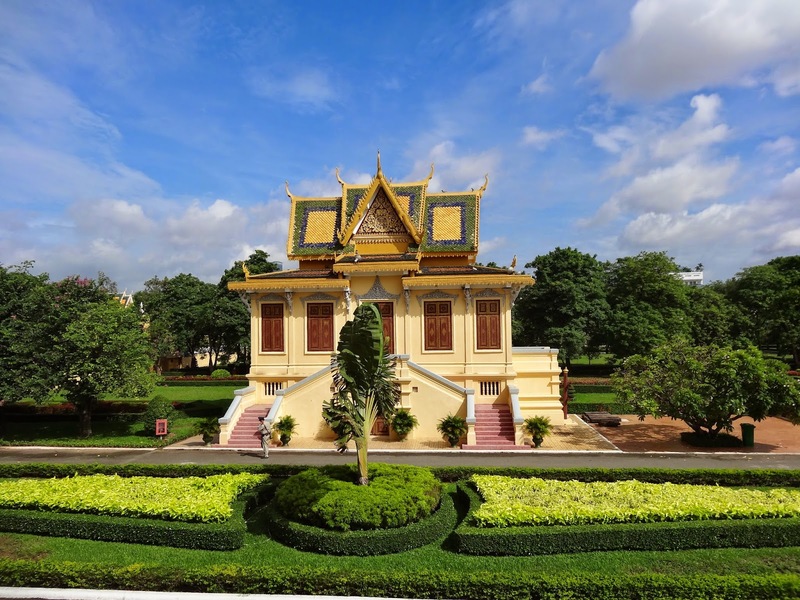 The walls surrounding the pagoda are the oldest part of the palace and are covered with one large fresco showing the Khmer version of the Ramayana. 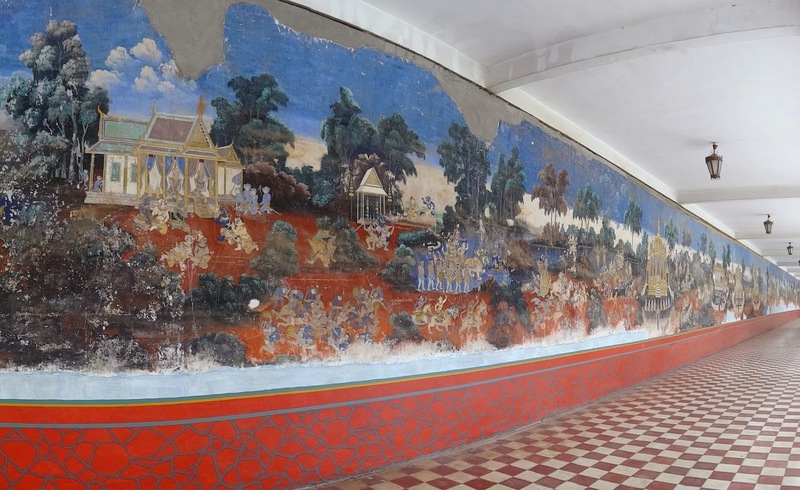 Although it has sustained weather damage in places the 650m long painting is still impressive. 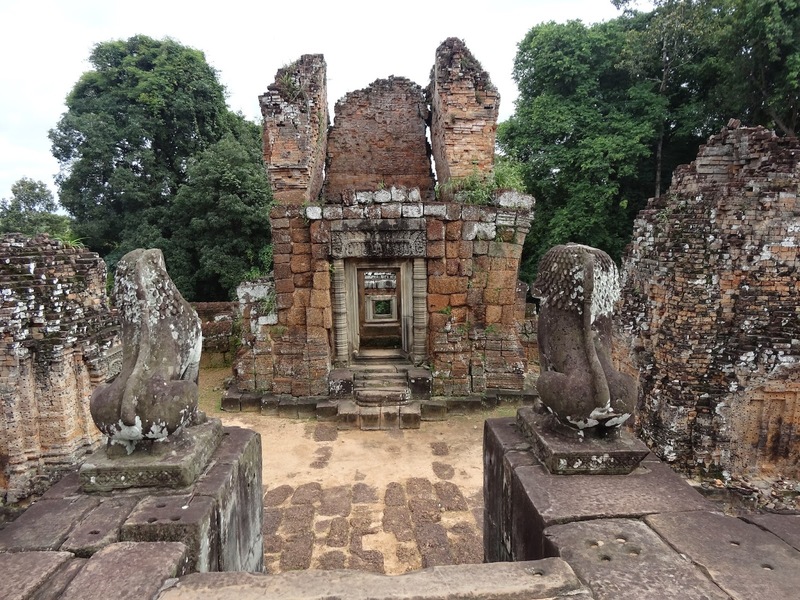 Some tombs of former Kings stand in the grounds between the fresco walls and the pagoda. 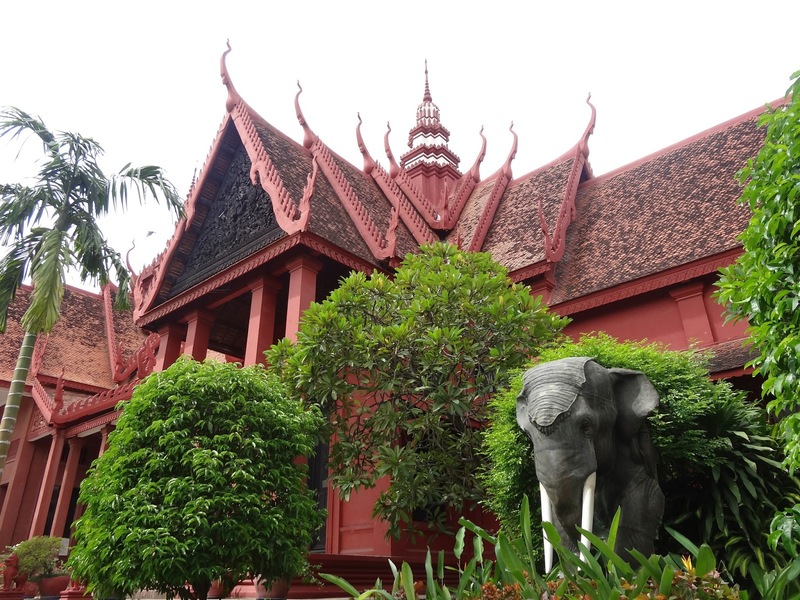 Finally to finish off the day we paid a visit to the National Museum which is housed in a recently restored beautiful red building originally opened in 1920. 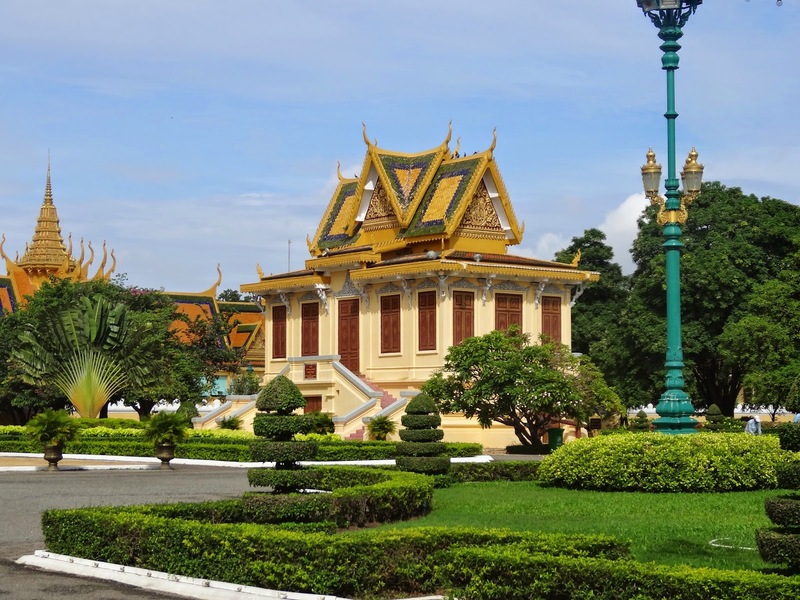 As with a lot of Cambodia it was devastated and evacuated during the Khmer Rouge reign. Although the actual exhibits were interesting and the building externally stunning the inside really felt in need of a face lift. 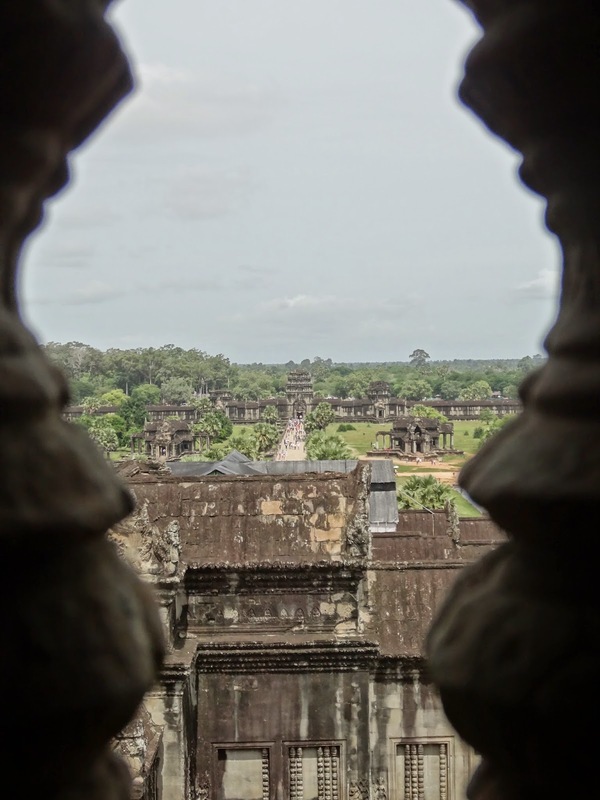 The walls were dirty, the glass needed cleaning and the whole interior felt poor compared to the air conditioned and slick Angkor National Museum we had been lucky enough to see the day before due to our delayed flight. 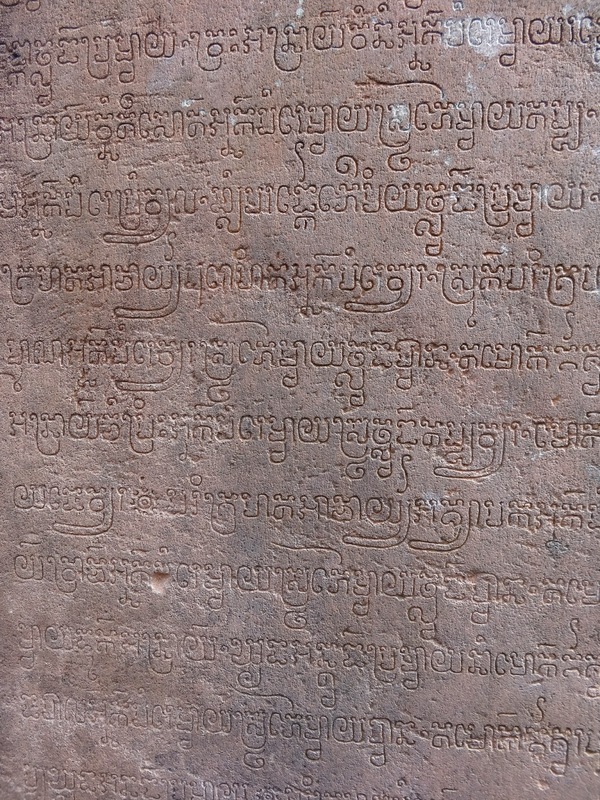 It’s also a shame that Phnom Phen in general feels less safe than Siem Reap which we really loved. Beggars approach the car when we stopped in traffic and it’s not safe for westerners to walk in many areas at night. Homeless families sleep rough by the roadside and the whole place felt quite dirty, rather like the large Vietnam cities did. This is the state of a developing nation, still trying to recover from its stricken past. Ultimately the people here are friendly, smile a lot and are happy to welcome you to their country. 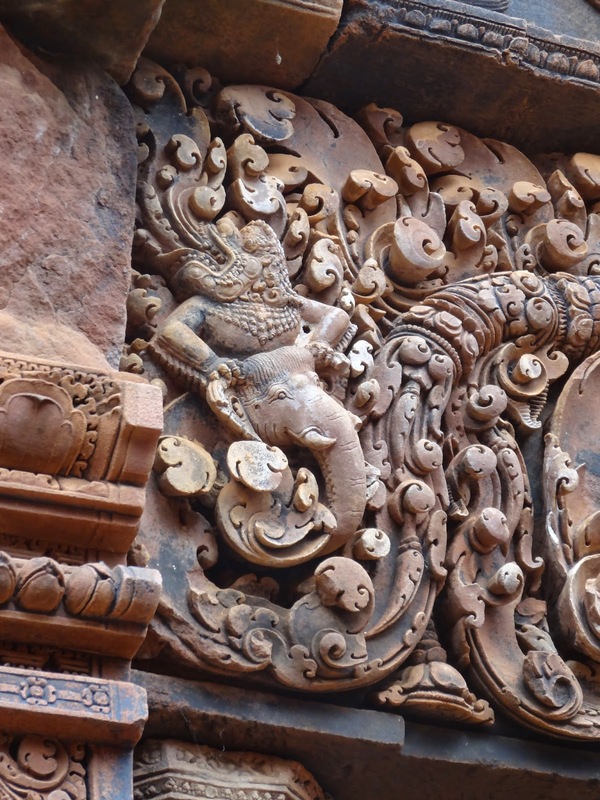 Beautiful carvings can be found at Banteay Srei temple dedicated to the Hindu god Shiva. The others, whose names escape me, show some amazingly rickety looking walls made form clay bricks, over 1000 years ago. 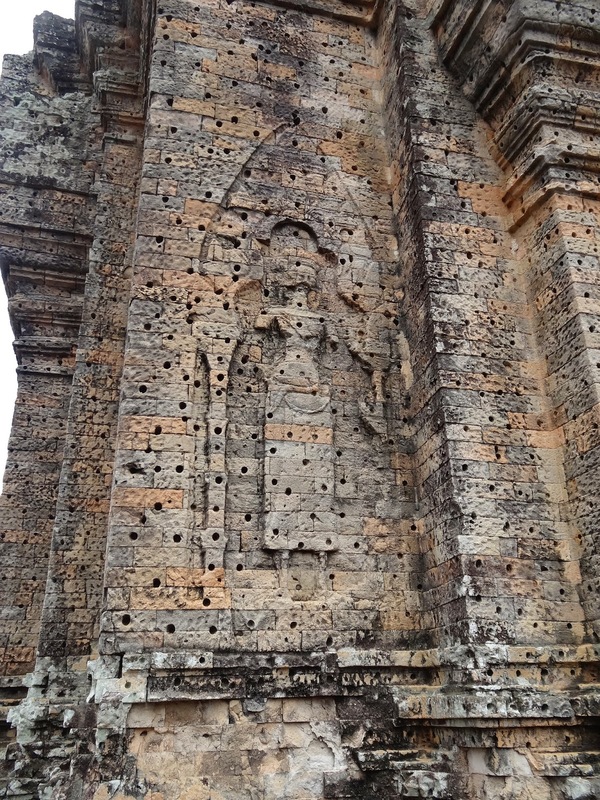 It really is amazing that a temple build 1000 years ago can still stand 100% original, with no restoration. 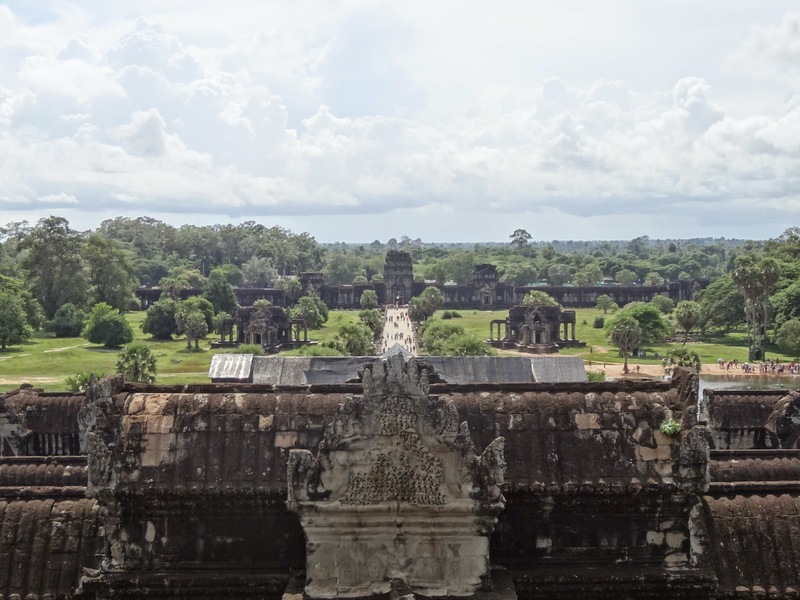 Most people enter the ancient capital of Angkor Thom through the south gate where 54 gods and 54 demons take part in an epic tug of war. This would have been an intimidating entrance to have to pass through in the 13thcentury. For us the religion involved here is confusing to say the least. 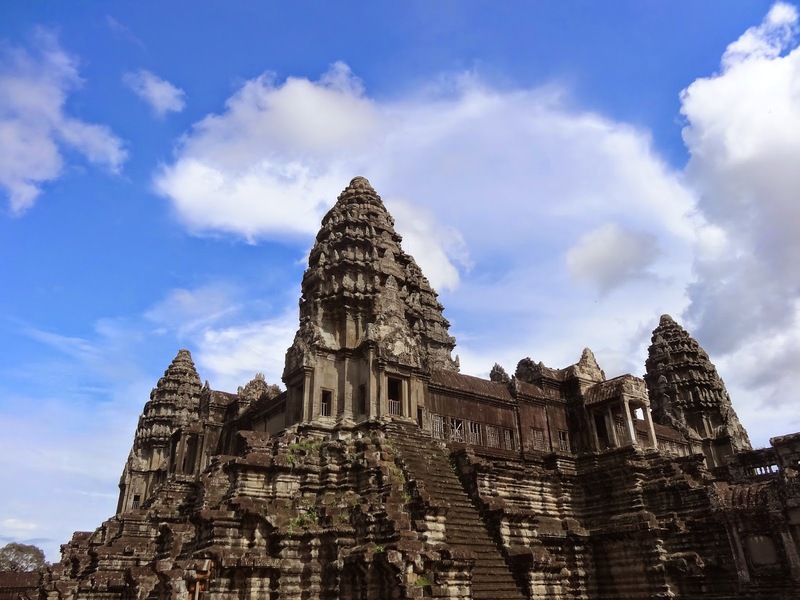 Part Hindu, part Buddhism the Khmer people changed their minds over the years before eventually settling on a combination of the two. 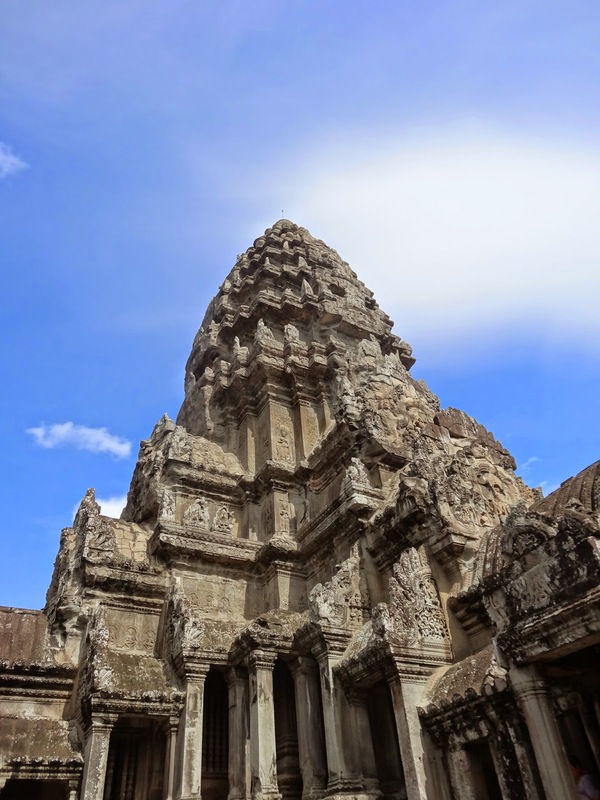 Bayon is the temple of many faces. All 54 towers are decorated with faces that seem to stare down on you from every angle. Viewed side on with a blue sky behind and these faces look even more other worldly. 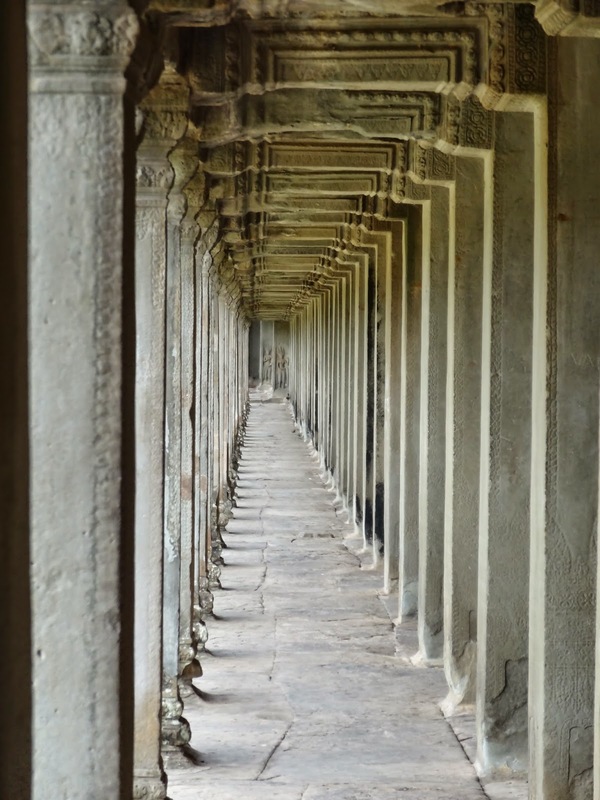 Terrace of the Elephants, 350m long and decorated at each end with elephants was used as a viewing stand for ceremonies, a real sign of the size of the Khmer empire at its height. 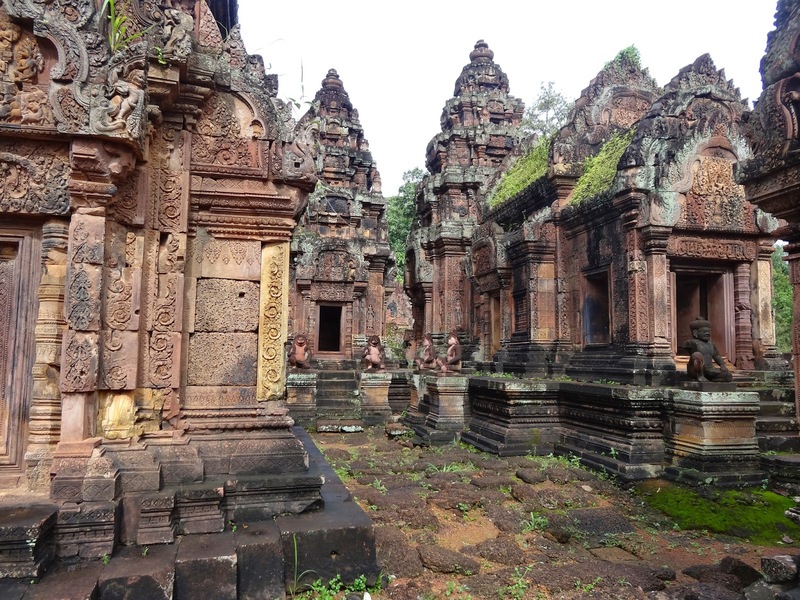 Many of the temples lay untouched in the jungle for years and it is a testament to their solid construction that they remained. 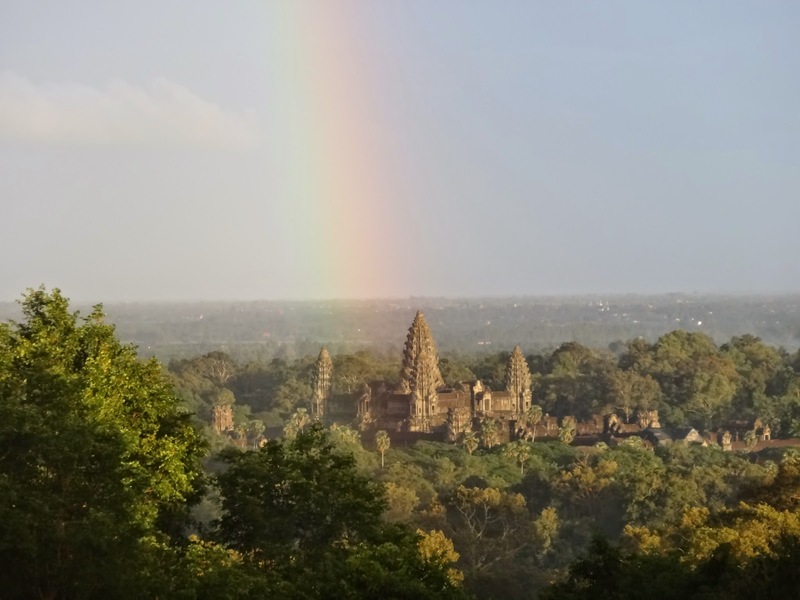 Ta Prohm however, reminds us of the power of nature. Here huge trees grow out of the temple roof and huge snake like roots threaten to crumble the walls. 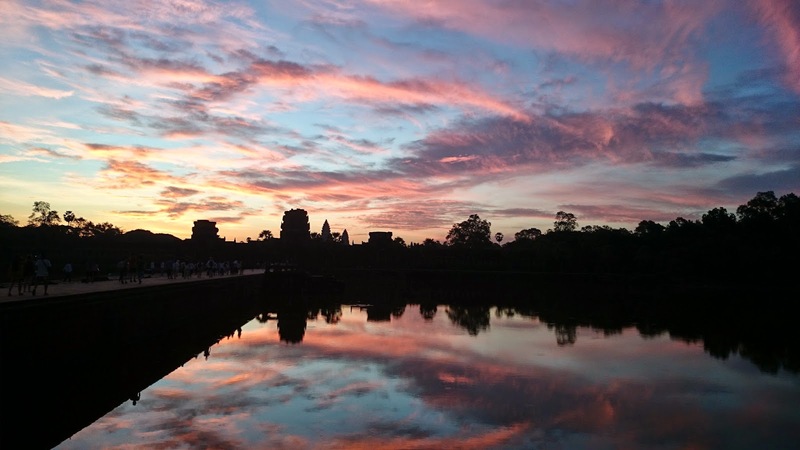 Angkor Wat is the largest religious building in the world and really is a site to behold. First you must cross a large moat to the outer walls. The water in the moat is always still creating a beautiful refection. 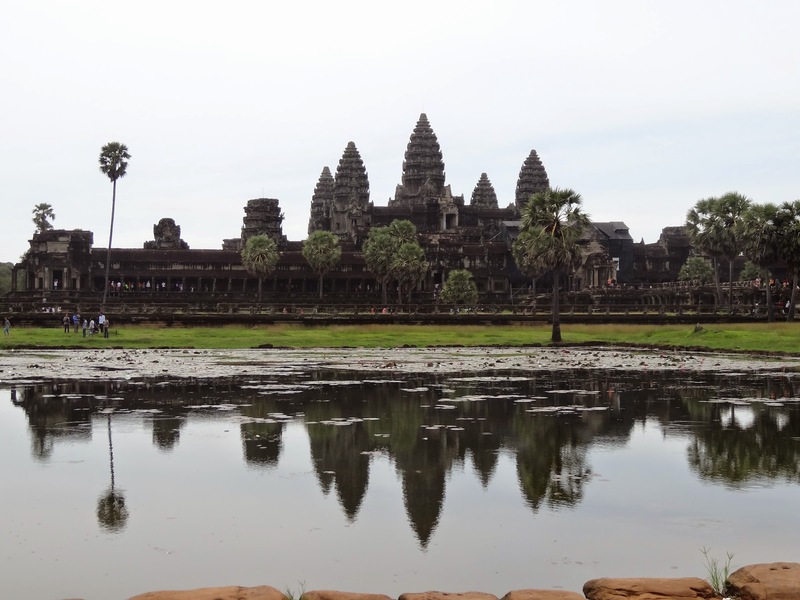 The moat surrounds Angkor Wat and is 1.5km by 1.3km around and is 190m wide. 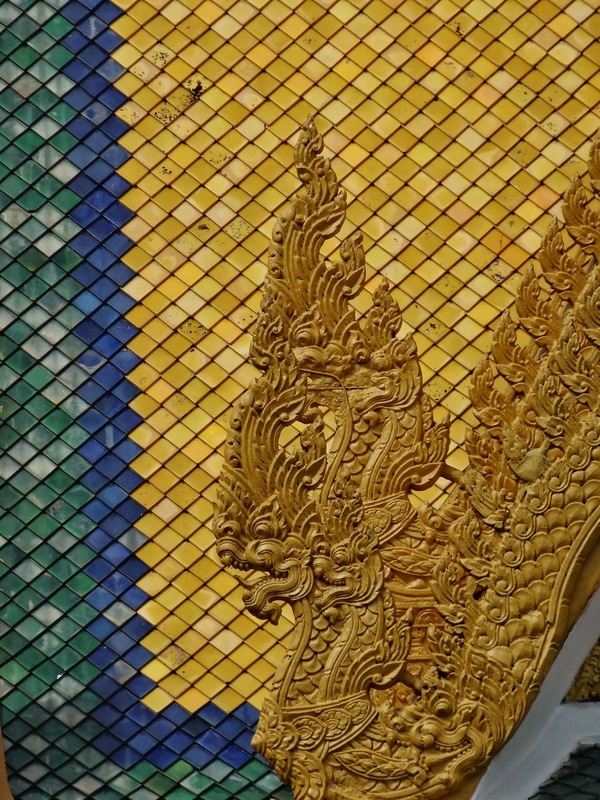 This temple is dedicated to the Hindu God Vishnu. 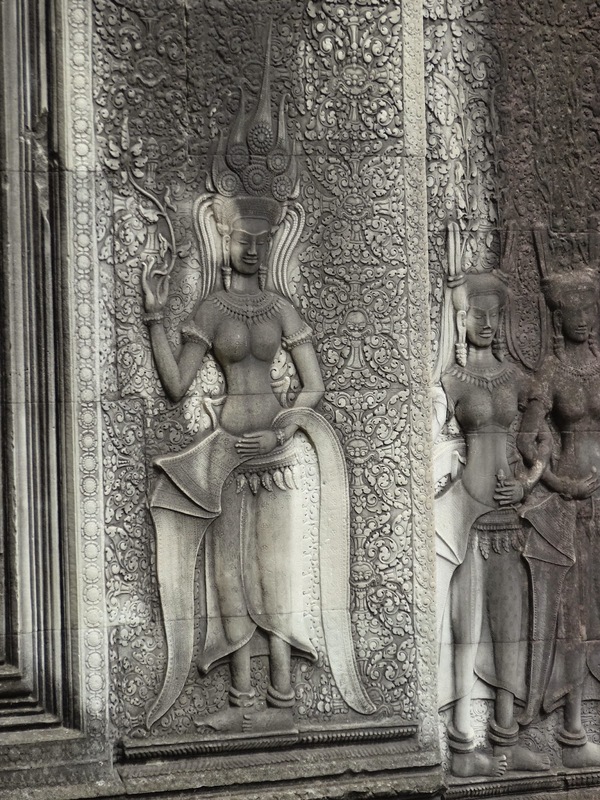 Many carvings of the beautiful Apsara , the female spirit of the clouds and water, don the walls of the Angkor Wat. 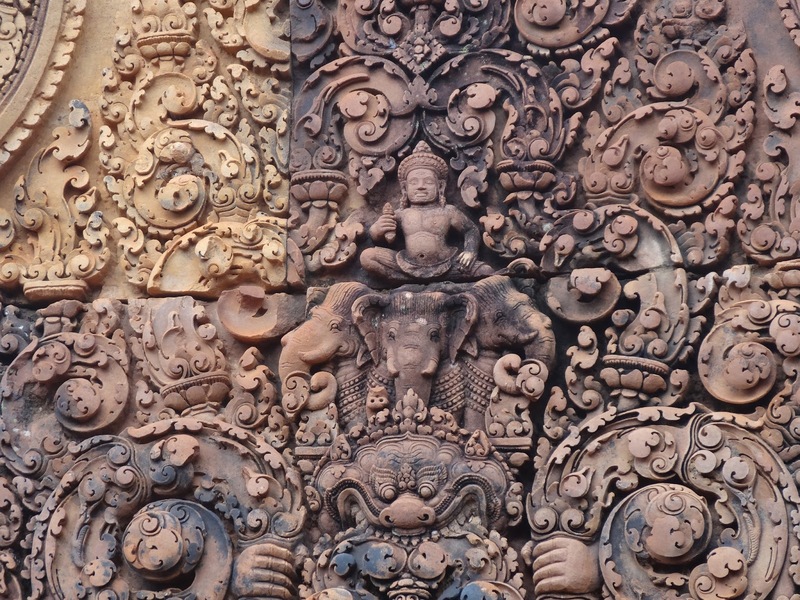 Apparently the Apsara are carved with 36 different hair styles within this temple. 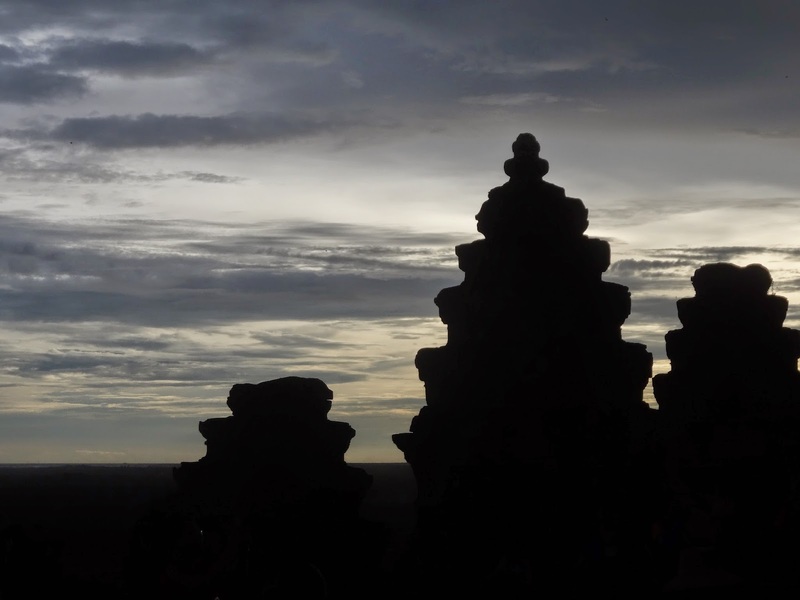 The building represents Mt Meru, its surrounding peaks and is bounded by continents and the ocean. Mt Meru is the centre of the Hindu spiritual and physical universe.